SpaceX released new images today of the sleek interior of “Crew Dragon,” SpaceX’s spacecraft designed to carry humans to the International Space Station, and possibly other future destinations. If things go as hoped, the first commercial crew flights under the Commercial Crew Transportation Capability (CCtCap) program contract could take place in 2017. UPDATE: SpaceX added a new video of the Crew Dragon in orbit, which you can see below, in addition to a video that provides views of the interior. The futuristic interior is “designed to be an enjoyable ride,” says SpaceX. Four windows provide passengers with views of Earth, the Moon, and the wider Solar System right from their seats. The seats — which don’t look especially plush — are made from high-grade carbon fiber and Alcantara cloth. SpaceX provided just snapshots of parts of the interior, and so its hard to get a feel for what the entire crew cabin will be like and how roomy it might be. NASA named four astronauts earlier this year who will fly on the first U.S. commercial spaceflights on either SpaceX or Boeing crew transportation vehicles. The agreement between NASA and the commercial companies is that at least one member of the two person crews for the initial flights will be a NASA astronaut – who will be “on board to verify the fully-integrated rocket and spacecraft system can launch, maneuver in orbit, and dock to the space station, as well as validate all systems perform as expected, and land safely,” according to a NASA statement. The second crew member would likely be a company test pilot, but the details remain to be worked out. There’s not been indication as of yet if the explosion of the SpaceX Falcon 9 rocket and Dragon cargo ship loaded with supplies for the International Space Station (ISS) on June 28, 2015 will have an impact on when the first crewed Dragon flights will take place. The explosion happened about 148 seconds after an initially successful launch. It was later determined an in-flight failure of a critical support strut inside the second stage liquid oxygen tank holding a high pressure helium tank in the Falcon 9 rocket was the likely cause of the accident. Crew Dragon features an advanced emergency escape system to swiftly carry astronauts to safety if something were to go wrong. Credit: SpaceX. SpaceX said the escape system provides a safe way to carry astronauts to safety if there is a problem and the crew would experience about the same G-forces as a ride at Disneyland. 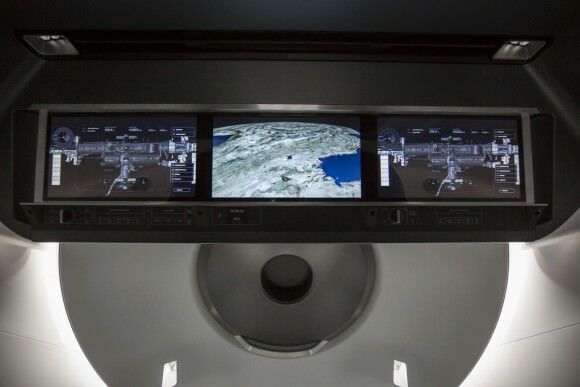 Crew Dragon’s displays will provide real-time information on the state of the spacecraft’s capabilities – anything from Dragon’s position in space, to possible destinations, to the environment on board. Credit: SpaceX. Crew Dragon has an Environmental Control and Life Support System (ECLSS) that provides a comfortable and safe environment for crew members. During their trip, astronauts on board can set the spacecraft’s interior temperature to between 65 and 80 degrees Fahrenheit. Credit: SpaceX. Crew Dragon will be a fully autonomous spacecraft that can also be monitored & controlled by on board astronauts and SpaceX mission control in Hawthorne, California. Credit: SpaceX.